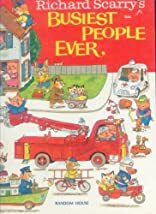 Richard Scarry's Busiest People Ever! Richard Scarry's Busiest People Ever. Highly detailed panoramic views of Busytown explore the jobs that people have and what they do to keep things running smoothly.